Protect the Harvest presents the First Annual Wild Spayed Filly Futurity, sponsored by Lucas Oil. 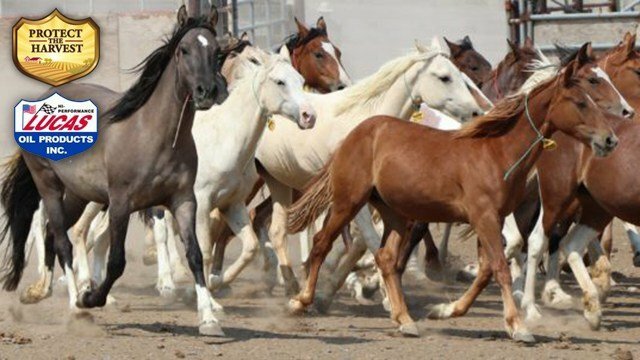 In 2017, twelve fillies that had been selected from wild horse herds and subsequently spayed, vaccinated and handled for 30 days, were offered for sale at the Reno Snaffle Bit Futurity. These fillies are invited back to the 2018 Reno Snaffle Bit Futurity to compete in their own division for a $25,000 purse. The principal goal of the Wild Spayed Filly Futurity is to showcase the significance and abilities of these resilient, tough and beautiful horses, demonstrating their trainability and hopefully encouraging more people to consider a horse from our American rangelands. A secondary but very important goal of the program is to help find economical and safe solutions to controlling the numbers of horses on American rangelands, allowing people to appreciate them in a healthy, balanced environment in the wild. Mon, Apr 22 – This unique event features twelve horses chosen from wild herds that were sold and invited back one year later to compete for a purse of $25,000. Fridays – 6 PM ET | 5 PM CT | 4 PM MT | 3 PM PT – Folksinger Michael Johnathon hosts a wide variety of musicians from folk, blues, country, jazz, new-age, and rock to celebrate the traditional American experience through song. “The Duttons Through the Years,” chronicles the more than 30-year journey of the Duttons from a young family having fun together in their spare time to one of the country’s most beloved entertainment groups. Fridays – 8 PM ET / 7 PM CT / 6 PM MT / 8 PM PT – Every week you're invited to spend time with your favorite country music heroes as they share the stories and sing the songs that made them famous. Fri, Mar 2 – 8 PM ET / 7 PM CT / 6 PM MT / 5 PM PT – “Another Wednesday Night Prayer Meeting:” Country favorites share memories of growing up in church and perform their favorite gospel songs, all guided by Bill Anderson.